"I want to be a scientist now!" shouted one enthusiastic fourth grader at San Marcos Elementary School. 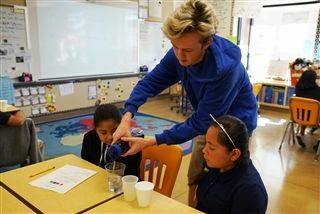 He had just participated in a science experiment with upper school service learning group Educating Near & Far. The group visits different local elementary schools to spread lessons on STEM. The service learning group is also raising funds to build a school in Nicaragua and is $2,000 away from their goal of $10,000!